NU provides hostel facilities to students on all campuses. Student Support Services at respective campuses in liaison with admissions office allots hostels / accommodation to students during admission process and take care of the day-to-day management of all hostels. The transport facility is provided between campuses and the hostels managed by college management. Food & Dining Options at Campuses: Canteen & Cafes offers a selection of hot and cold drinks as well as a variety of snacks. This is a relaxing place to for students to meet before, after or between classes. In addition, due to the central location there is a wide selection of cafes, restaurants catering to every taste, culture and dietary needs on campus. Some of the food outlet at campuses, are, Café Forte / Café Connect / Café Village / Café C+ / Student Stalls / Café Heights / Café Bristol). They are reasonably priced, regularly monitored and supervised by both internal as well as external authorities for health and hygiene. The college hostels are designed to be comfortable & adequate to all students. 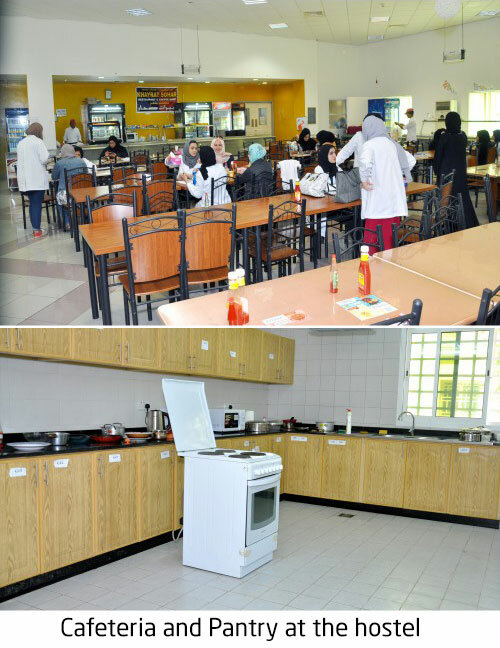 It accommodates 142 students and three house mothers. 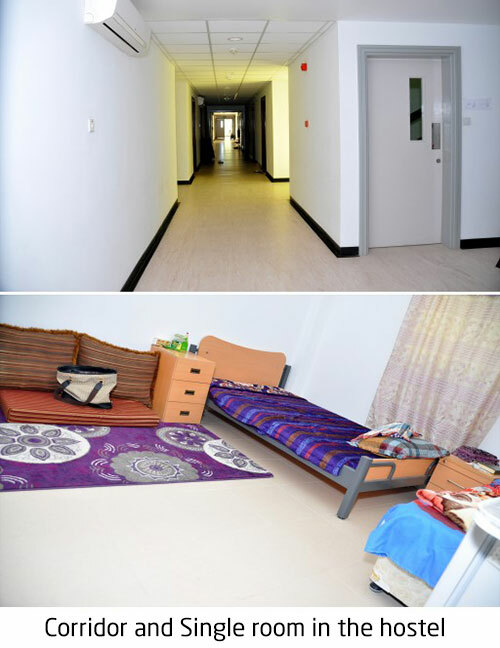 It has four floors and with 48 rooms and each room is accommodating three students. The student handbook has all the rules and regulations for the college hostel which students are insisted to read and strictly follow. To educate students and to enable them to adapt themselves to a disciplined mode of life whichwill prepare them to be useful citizens in their future life. To inculcate in the students a feeling of mutual help, self discipline and adjustments in the societyin which they live and to train them to live together peacefully in society. To facilitate parents to educate their children properly and without anxiety. All students residing the hostel must fully abide by the Hostel’s Rules & Regulations. Violation canlead to dismissal of the student from the hostel. Students who seek admission to the hostel should apply in the prescribed form along with the assurance by their guardians for the good conduct and behavior of the student during her stay in the hostel, complying with the hostel rules. Every student is required to carry with her hostel/college identity card and produce the same to the authorities as and when demanded. No student shall be absent from the hostel during night time without prior written permission from the housemother. Students should not create any inconvenience to other residents of the hostel. Application for leave of absence from the hostel shall be made in advance to the housemother. Residents will make sure that the application is sanctioned before the student leaves the hostel. The housemother has the right to refuse admission to the hostel premises to any one considered undesirable. Guests shall not be allowed to stay in the hostel. They must ensure that the lights, fans and Air Conditioners are switched off when the rooms are unoccupied. Failure to comply with rules will make them liable to pay fine of any amount fixed by the College Management. Students are liable to be penalized by the house mother if found any posting or writing on doors and walls. Every student shall keep the room allotted to them clean and neat. They shall take proper care of the furniture and fixture handed over to them. The hostel authorities have the right to enter and inspect the rooms at any time, even in the absence of students. It is the responsibility of the residents to wash and clean all vessels and plates they use for cooking and eating. Cleaners will only take away the waste and containers deposited in the waste basket. Students alone are responsible for the safety of their personal cash and valuables. No meeting, parties or gathering of the residents for political purpose shall be held inside/ outside the hostel without prior consent of the Finance and Administration Manager or the hostel supervisor. All visitors shall have to sign their names showing relationship with the resident concerned in the Student Exit Permit Form available with the house mother. No student shall exchange her room with another student without the prior written permission from the housemother. Visitor’s hours in the hostel will be on Monday and Thursday only for four hours from 5pm to 9pm. Student, who is going out with a temporary permit, must return to the hostel not later than 10 pm and on Thursday and Friday, they should return not later than 11 pm. Public phones in hostels are meant for all students. Therefore, students should remember to use them with consideration for other students. Students who find their roommate(s) missing for more than 48 hours must report them to the hostel supervisor. The main gate/door will be closed daily from Saturday to Wednesday at 10:00 p.m. On Thursday and Fridays, the door will be closed at 11:00 p.m.
Students should sign in daily at 9:00 p.m.
Hostel Fees & Caution Deposit are collected in advance for the month. The fees shall be paid for full month in case student stays less than 15 days in a month, she will be asked to pay half of the amount. The fees will be waived only for annual vacation time for the students, i.e. for August every year. In case student loses the room key, the Department will deduct its value from the Caution Deposit amount. Students can go outside the hostel in the weekend and holidays only with authorized people. Student going outside the hostel should return before 10 pm. However, on Thursday and Friday; the student can reach the hostel not later than 11pm. Any delay on returning to hostel on time, the student should bring written proof from the guardian. During the study days, the student should get permission from Student Affairs Officer to go out in cases of emergency. Visiting days will be only on Monday and Thursday from 5pm to 9 pm. A verbal warning by the House Mother when a rule is violated for the first time. A written warning from the Honorary Warden if the violation is repeated. Copy of the warning letter will be kept in the student’s file. Continuous violation of rules will attract temporary/permanent suspension of the student from the hostel and the matter will be reported to the parent/guardian. If for any reason/s a student is dismissed from the college, she will automatically be dismissed from the hostel also. Peace of mind, Welcome to on-campus housing at CE, Living on campus will benefit you in a number of ways. You will save money, meet new people and attend all sort of fun events. Housing and residence life aims to make your living experience forgettable. Housing and residence life offers different housing facilities. Prospective Students, Knowing when you need help is the first step. Let us assist you college Student Counselor or get advice from experienced staffs. Visit Student Support Services. Room M05 Contact number 24536165 Ext 278. Accommodations: College of Engineering – Residences are situated in campus and off campus for boys and girls. All residences are within the driving range of to the college. Services & Facilities: Rooms benefit from a work desk, fresh bed & pillow and cupboard. Some of the rooms have a private bathroom. Free WiFi is available throughout the hostel. There is a cafeteria or shop and where students can purchase breakfast, lunch and dinner. At the property on availability provided are Free parking, Recreation Room, Canteen or Shop on site, Computer Lab, 24 Hours Security, Reception Hours, Non-smoking rooms, Common Guest Lobby or Sitting Room, TV hall, Kitchen, Facilities for disabled, courtesy transportation to college, First-Aid on site (AHC) and any emergency cases are immediately reported to nearest health center and hostel equipped with First-Aid box and warden aid staff, Shopping Trips (girls) and Education tours. Activities: Students benefit from different program activities planned during the study semester. Free shopping, Education tours, hostel community exhibition and National functions held annually. Customized student design activities entertained with coordination of hostel wardens. Location: Town services like malls and hyper markets are within the driving range from 1.5 km to 9 km College residence are the best places for the student from different community to meet and live a cooperative life in a special community. College residence is a great choice for all students with amenities provided to the hostels. Comfort: Staying in the hostel gives a high degree of comfort as it is rated as the best and value for money by the inmates. The facilities and amenities available are more for their money when compared to other hostels in this city. Students develop team work skills and sharing of knowledge, enhanced communication and interpersonal skills while staying in the college hostel. Meet your Hostel Wardens Supports: College hostels are monitored by Wardens look after the welfare of the students and maintains disciple. College warden has the authority to check the room and visit the students at any time. Warden is custodian and in charge of all the hostel properties. Warden has to verify the stock periodically. Warden has the authority to take suitable disciplinary action expect expelling an Inmate from the Hostel. Current Student: as a current student, you most likely know the “ins and outs” of the campus living. College of Engineering would like to make things easy for your every year! Pay your rents, browse campus and activities and apply for a meal plan from list of restaurants. Visit Student Support Services. Room M05 Contact number 24536165 Ext 278.